Looking for a juicy and delicious burger recipe? Look no further! 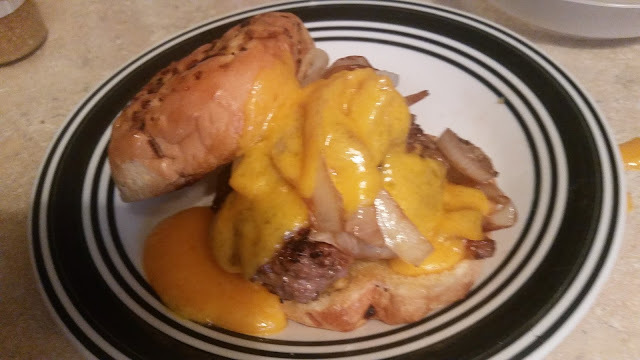 Tender, juicy beef, grilled onions, and creamy cheese all on top make for a tasty burger recipe your family will love! 2. In a medium bowl, lightly mix together the ground beef with black pepper and salt, worcestershire sauce, liquid smoke. Form into 3 patties.Over handling will make meat tough.cook very low heat nice and slow to juicy to create juicy burger...I sometimes cook these burgers in an Iron skillet. Saute sliced onions with 2 table oil and 1 tablespoon liquid smoking flavoring place in skillet until soft and done.